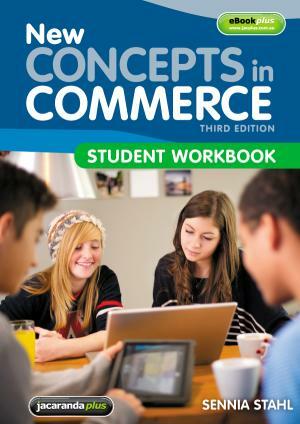 New Concepts in Commerce, Student Workbook, 3rd Edition is a student-centred resource designed to be used as a companion to the student textbook New Concepts in Commerce Third Edition. The workbook is available in a choice of two convenient formats  print and digital. • Coverage of the four core syllabus topics of Consumer Choice, Personal Finance, Law and Society, and Employment Issues. • Worksheets focus on the literacy, practical, thinking and study skills needed for success in Commerce. • The workbook can be used variously for classwork, homework or revision. • Worksheets are provided in Word and PDF formats. • Students can print out and complete PDFs or complete in Word and submit electronically. Whether in print or digital format, this student workbook helps make the study of Commerce an interesting and enriching experience as students learn life skills for now and the future. Click here to view a New Concepts in Commerce Third Edition Value Pack.